Gold is all the rage right now. And some apparently think that if you aren’t outright ‘bullish’ you are unaware or unintelligent. Those who ply the trade for a living (i.e. advisors, investors, traders, writers) all seem to be on the same page. Even fundamentalists and technical analysts are teammates. Sort of. The U.S. dollar is in the headlines, so naturally, most of the explanations and expectations for gold’s ‘big move’ center on U.S. dollar weakness. And they should. But some additional explanation is necessary. Some say that a weaker U.S. dollar ’causes’ a higher gold price. That is like saying that lower interest rates cause higher bond prices. That’s not the way it works. Gold and the US dollar move inversely. So do bonds and interest rates. If you own bonds, then you know that if interest rates are rising, the value of your bonds is declining. And, conversely, if interest rates are declining, the value of your bonds is rising. One does not ’cause’ the other. Either result is the actual inverse of the other. When you were a kid you probably rode on a see-saw or teeter-totter at some time. When you are on the ground, someone on the other end of the see-saw is up in the air. And, vice-versa, when you are up in the air, the other person is on the ground. Again, one does not ’cause’ the other. Either position is the inverse of the other. Most of those who comment on gold consider the dollar to be one of several factors contributing to a higher gold price. But, in truth, gold’s price reflects only one specific thing: changes in value of the U.S. dollar. 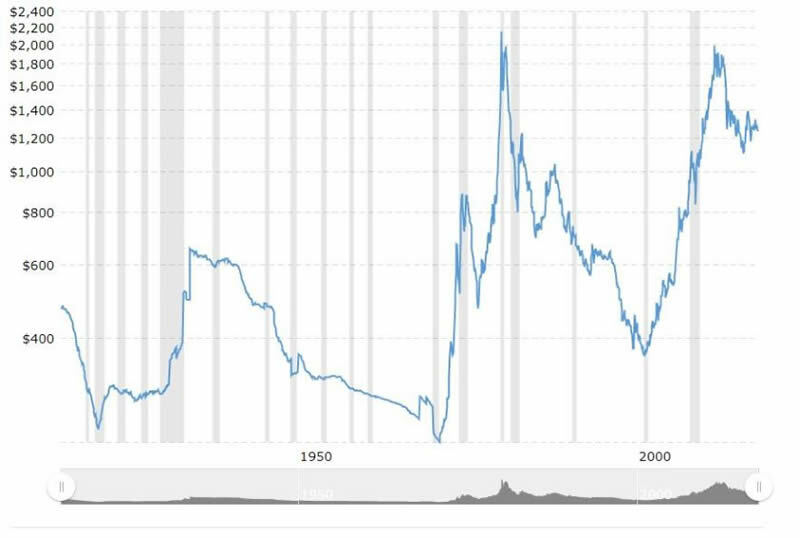 Since gold is priced in US dollars and since the US dollar is in a state of perpetual decline, the US dollar price of gold will continue to rise over time. There are ongoing subjective, changing valuations of the US dollar from time-to-time and these changing valuations show up in the constantly fluctuating value of gold in US dollars. There is also more talk about inflation recently. So here is an axiom to remember: inflation is the debasement of money by the government. When you hear someone referring to things such as ‘cost-push’ or ‘demand-pull’ inflation, accelerated wage growth pressure, or an ‘over-heated economy’, listen politely. But know that there is only one cause of inflation – government. And government in this case includes central banks, especially the United States Federal Reserve Bank. Government creates inflation by expanding the supply of money and credit. They do this intentionally and continually under the pretense of managing the economic cycles. Since inflation, as practiced by government, is ongoing, the risks are cumulative. As that cumulative risk builds, events triggered by the effects of inflation become more volatile; and they are unpredictable. When the Federal Reserve responded to the financial crisis of 2007-08 by increasing hugely their monetary expansion efforts, many thought that it would lead to runaway inflation and collapse of the U.S. dollar. It didn’t. But it did drive the prices of assets like stocks, bonds, and real estate, much higher. Originally, of course, the price of gold surged in response to the Fed’s efforts. Since gold’s price is an inverse reflection of the U.S. dollar, it should come as no surprise that the dollar continued its long decline in value; and significantly so. But the drop in the value of the dollar and gold’s higher prices from that point forward were mostly in anticipation of damaging effects from the Fed’s inflation in the form of significantly higher prices for all goods and services. In essence, a repeat of the seventies, only much worse, was expected. And the looming threat of U.S. dollar repudiation fanned the flames. But there was no significant increase in the “general level of prices for goods and services”. And U.S. dollar weakness (possibly overdone) eventually reversed and the price of gold began to decline (2011 – see chart above). Between 2011 and 2016, the U.S. dollar continued to strengthen and gold’s price continued to decline. At that point the two reversed direction again and that brings us to where we are currently. Some are convinced that recent dollar weakness will continue unabated and that the price of gold will soar soon. Some are still banking on severely damaging effects from the Fed’s past money creation efforts. And still others are short-term traders who are looking at their charts and want to be “on the right side of the trade”. 1)The fundamentals and logic involved are inconsistent and flawed. 2)The effects of inflation are volatile and unpredictable. Applying investment logic to gold leads to erroneous conclusions. Gold does not react or correlate with anything else – not interest rates, not jewelry demand, not world events. Changes in gold’s price are the direct result of changes in the value of the US dollar. Nothing else matters. Since paper currencies and credit can be manipulated by government, expectations and reactions become more volatile and increasingly unpredictable. That should be relatively clear; especially after what we have experienced in the past ten years. But some are still predicting a gold ‘moonshot’. And they want it now. Something like that may occur. In fact, it is quite possible. But when? It will only happen if it is accompanied by a complete collapse and repudiation of the U.S. dollar. The chart above is current. Does it look like we are in the midst of something similar to 1970-80 or 2001-11? Or something worse? Yes, forewarned is forearmed. But most of those who are the most vociferous in their calls for huge increases in the price of gold are those who were doing so all during gold’s price decline from August 2011 through January 2016. What’s changed?